What holds you back from your dreams? Our fears encompass everything from acceptance and belonging to safety and financial security. We worry about what others think and feel about us. We worry about how others perceive our opinions and beliefs. We worry about how our choices impact others. Then we stop to fret about alienating some people if we support a popular cause or issue… and others if we don’t. Unfortunately, work environments are no exception. They present their own unique version of potential doubts. We worry about job security and advancement. We question our qualifications and value to our employer. And we tend to readily believe the negative things we hear regarding our performance, then discount the positives just as quickly. This is the territory we navigate in modern times. Its constant presence is one of the reasons we are often conflicted and divided in our decisions. This is also why so many of us are unable to find the courage to create the changes we deeply desire. It’s also the root of why some people stay stuck for years, if not decades, in work and relationships that do not meet their needs. But our forward momentum isn’t the only thing fear impacts. All this worry and the stress it produces has a physiological impact on our bodies as well. Like the mortal fears of our ancestors, modern concerns trigger the same internal responses. Linked to a variety of ailments, recent studies have proven that stressful environments – from relational turmoil to jobs that demand continuous multitasking or high-pressure deadlines – actually erode our ability to achieve, and worse. Workplace worries provide an excellent and all-too-common example. Have you ever awoken in the morning with a sense of dread as you begin to think about your day? Worse still, have you woken in the middle of the night and been unable to go back to sleep because your mind started dwelling on what was waiting for you at work? If either of these scenarios sound familiar, you’re not alone. A recent article published by the American Psychological Association estimated that more than 40 million Americans struggle with some form of sleep disorder as a result of stress. Count all the sheep you like. You’ll never get back to sleep if you start spinning out of control on something like this. Trust me: I’ve been there. Unfortunately, this is when many people turn to pharmaceuticals (not to mention a wide range of recreational self-prescribed options). The rise of this stress within daily life also coincides with a sharp increase in the frequency of overdose. An article published in Women’s Health found the number of emergency room visits due to the overmedication of zolpidem (the active ingredient in certain prescription sleeping pills) had doubled between 2005 and 2010. The stat jumped from 21,824 visits in a two-year period to 42,274, with women accounting for two-thirds of those cases. The quick fixes these options can provide temporarily relieve stress, but only in the short-term. Long-term use creates a wide range of additional physical and psychological problems. All this without addressing the root cause of the issue: fear. 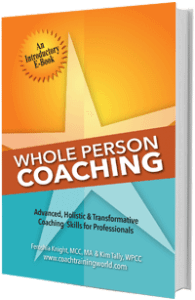 As Whole Person Coaches, we recognize the necessity and value in working with the whole person. This process often begins by uncovering the true source of an individual’s struggle in light of their truest desires. This is also why it’s essential to recognize the signs of fear and its impact. 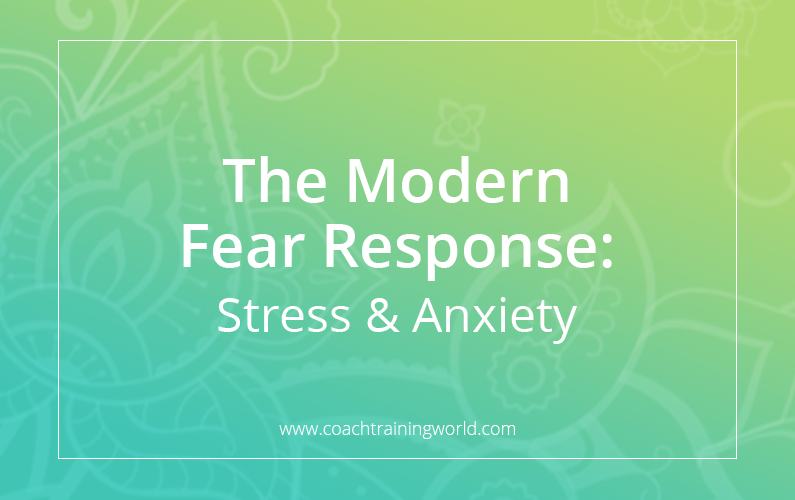 In fact, the biggest challenge clients overcome when working with a coach are their fears. Client fears are just like yours and mine. They take shape in familiar patterns. Foremost are the fears that keep them stuck in an outdated version of themselves and a life they no longer wish to live. Then you’ll discover the fears concerning whether or not what they truly want is actually possible. Once you help your clients tame their fears, the worry and stress disappear (and you suddenly look like a miracle worker!). Unfortunately, this will be no small task for some clients. The physiological effects of fear can be crippling and are often avoided at all costs. Modern life simply creates too many “false alarms.” These in turn trigger the fight or flight response, causing an individual’s life to stall for weeks, months or even years. Because while the occasional confrontation can cause even the strongest of us to shift our behavior somewhat, guess what happens when these types of stressors are an omnipresent part of daily life? Fight or flight situations and responses are examples of fear and its anxiety-producing effects. They provide information related to our psychobiological status. But when we operate within a setting in which these pressures are ever-present, we accept elevated stress levels as the norm, suffering both short- and long-term effects as a result. Fear and the way in which it expresses itself in an individual’s mind, thoughts, feelings, actions and interactions has a very real impact on achieving stated goals. In fact, fear is often what drives a client to a coach in the first place, though they themselves may not even be aware of it initially. As coaches and prospective coaches, it’s important we not overlook ourselves either. Even those of us with decades of experience in the business of change still feel that tinge of panic in the back of our minds whenever we face something new, unknown or unexpected. This is especially true when others are involved. The initial surprise is quickly followed by a burst of adrenaline causing our heart to beat a little faster. Then comes the “reasoning” presented by our inner critic encouraging us to take a step back… then two… then three. The difference between us and others is that we’ve come to realize fear for what it truly is, including these physiological responses. This enables us to evaluate the story fear is presenting. More importantly, it also allows us to logically work through it to achieve the outcome we truly desire – the one that will be best and most fulfilling for us long-term. We also realize the power of relationships to overcome our fears, especially fears related to our interactions with others. The study and awareness of fear gives you direct clues to the inner world of an individual’s mind. From there, you can help them by talking through the specific behavior patterns that are keeping them locked in outdated versions of themselves. It’s interesting that Steimer highlights fear of the unexpected in his paper because, as a coach, that is one of the most common phobias you are likely to confront. If you are a prospective coach or coach in training, you may very well be confronting this phenomenon as we speak. OK, at this point, that’s probably not a surprise to you. But it’s important nonetheless. As Whole Person Coaches, we champion our clients toward their best possible lives and total well-being. More importantly, we give them holistic tools that enable them to sustain their desired change indefinitely and extend it to any other aspect of their life. Summary Point: Whether you view fear as something that mentally holds you back from pursuing your dreams or recognize its well-documented effects on physical health and well-being, your fears are worth tending to. They are THE roadblock – the core of what keeps you (and your future clients) from achieving everything you want and deserve in life. Plus, as we’ll discuss in the next article for this series, your fears may not even truly be yours to begin with! We’ll also look at the cognitive functions that give fear the power it has over us. Knowing that the first step toward working past fear is to accept its foundation, we’ll address how we become conditioned to accept fear as “truth.” I’ll also offer some tips on how you can recognize and reverse this conditioning. Until then, spend a few minutes in reflection on the following exercise. Write down the things you fear most. It can be anything: people, places, things, or situations. How do these things affect your level of joy, happiness and fulfillment in life? Now write down what it would feel like to live a low-stress, worry-free life. Very helpful and motivational post. Thank you Alan, it’s certainly a topic that is of deep interest and hopefully value to others!